Imagine The Godfather combined with elements of Robocop, and you might have an idea of the foundation for Heat Guy J. Set in the near future in the city of Judoh, the show is one part science fiction and two parts detective drama, and the sum total is all entertaining. 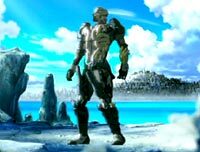 Androids are illegal in Judoh, due to their incredible destructive potential if programmed with ill intentions. Like any other weapon or tool, they can only do what humans make them do, and thus they are not an acceptable risk within the metropolis. 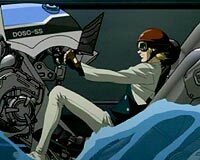 However, in order to maintain a defense against the use of such machines, one android is allowed to operate in the city. Known as J, he stands about seven feet tall and weighs more than an automobile, but don't let his looks deceive you - he's as nimble as a nervous wasp with an exponentially more powerful sting. J is part of an organization along with the humans Daisuke Aurora and Kyoko Milchan. The attractive and levelheaded Kyoko handles the intelligence portions of their operation while Daisuke participates in the dirty work with J. 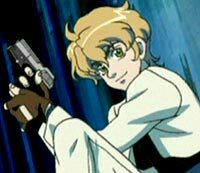 Thanks to a very limited budget, Daisuke is often only allowed a handful of bullets when he's on a case, and only when Kyoko allows it can he even possess a gun. Luckily, he's a crack shot and doesn't frequently make mistakes. This is a good thing, for a single misstep would likely end his life. J's team is responsible for detecting crimes before they happen, stopping criminals as they begin to carry out their illegal activities. They tend to get into situations that frequently require J's incredible fighting abilities, so life doesn't get too boring for Daisuke or Kyoko. While a number of small crimes are used to get the viewers introduced to the characters, the primary story is concerned with the actions of the various mafia groups inhabiting Judoh right after the most powerful leader of them all has just died. Daisuke knows that the death of the mob boss, known as Vampire, could potentially inspire an all-out mafia war as the various factions compete for dominance of the city, and it's up to him, Kyoko, and J to make sure minor skirmishes between sides don't escalate. However, the son of the former Vampire, Claire Leonelli, wants nothing more than chaos and destruction. He desires friction great enough for his father to see in the afterlife. With his cunning intelligence and myriad of destructive resources, Claire may just succeed. According to the trailer included on the bonus disc (in the Collector's Box edition of the release), this show originally aired at 1:50am. Even though it was on late, there's more than enough action to keep tired viewers interested with some incredibly well animated battle scenes between J and Daisuke's various foes. Another element that keeps the excitement high is the excellent soundtrack (performed by TRYFORCE), but to hear more about that, you'll have to check out my review of it elsewhere in this issue. This release comes rather close on the heels of the original Japanese DVD release (January 25th earlier this year), which is extremely quick compared to other domestic arrivals. The newness of the show radiates throughout the series, from the almost perfect integration of computer-aided animation to the silky smoothness of the more traditional animation. This show is a marvel to view in motion, with visual standards almost equivalent to the slightly older Cowboy Bebop movie, Knockin' on Heaven's Door. Of course, even better than the quick release is the fact that it's not 5000 Yen (roughly $45 USD), as it was in Japan. I alluded to the multiple releases of the show earlier, so allow me to expand upon that here. Anime fans are able to purchase Heat Guy J either with only the first volume or in a special (well-made) collector's box that also includes a disc of bonus material. There's only room for two other DVDs in the box, so this doesn't appear to be a very long series. However, it has an undeniably attractive style that I'm anxious to see more of in the near future. With strong characters, a good story and setting, and very high production standards, this is a show to watch out for. I suppose in the meantime I'll just have to listen to the soundtrack again.